Hello Puffin Bloggers – sorry to have been away for so long, I’m afraid my other work has been taking all of my attention lately. Goodness know what I’ll do if it really takes off! 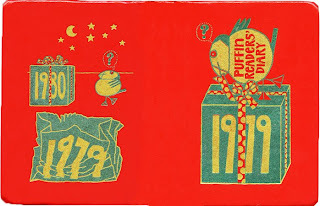 Anywho, here is a little restoration that I’ve been working on: The Puffin Readers Diary 1979! This delightful cover was not very good at keeping its Gold and Green foil intact – mine was very worn. I hope that other owners of this little work of art allow me the license of approximating the look of the complete foil image. This is one of my favourite Jill McDonald ephemeral images. I now have a cache of scans to work through, so I hope to resume normal service. Some great posts recently – I recognise several old favourites. This one inspired me to dig out my old diaries, and I find I've got 77,78,79 – 77 has survived the least well, partly cos all days were filled in. Wow! You've done better than me on the diary front. I'd love to see a high res scan of 78! A new treasure to practice my arcane skills on! Thanks for your continuing support, I'll try to keep going as long as I can.